Going for a job interview can be a nerve-wrecking experience. Many people rank a job interview as one of their most-feared experience – which is of little surprise since it is so similar to the popular fear of public speaking. We may have the required skill sets and aptitude for a job, but if we can’t keep our cool during the interview, we may very well blow our chances of getting the job in the first place. All our preparation for an interview would go to waste if we are unable to prepare for it emotionally as well. Do you tremble or perspire uncontrollably during interviews? Does your mind go blank when being asked a question during an interview? 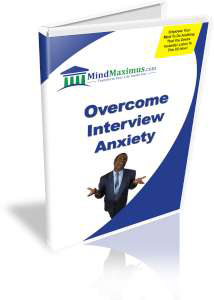 Have you always wanted to overcome your fear of interviews easily and effortlessly? Are you tired of not getting the jobs you want because of your inability to remain calm and collected during interviews? Thankfully, with the latest Brainwave entrainment technologies we can now effectively train our minds to overcome the uncontrollable anxiety that we feel before, and during an interview. From today, you’ll no longer have to worry about interviews – in fact, after you listen to these CDs you may even enjoy going for them! No reviews on H20 Overcome Interview Anxiety so far.